Summer is here! During June and July, we’re having a Cozy Days of Summer Giveaway here on Killer Characters! There will be a winner every day. 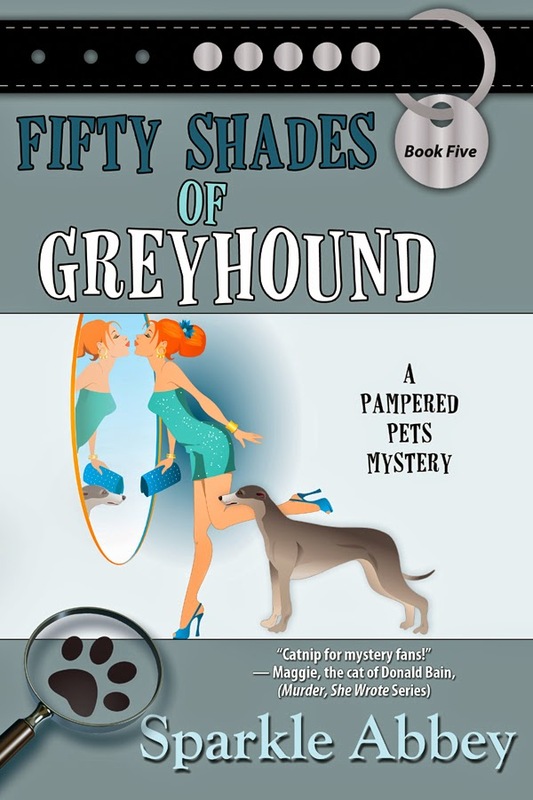 Today you can win a copy of Sparkle Abbey's latest book, Fifty Shades of Greyhound. Just leave a comment before midnight and be entered in today's drawing! Hi there, Mel here. Don't you love vacations? I sure do. Now that I'm a grown woman and on my own I get to choose where I go and what I do for a get-away. My vacations tend to be adventures like the Africa safari I recently bid on as part of a Laguna Beach pet rescue fundraiser. However when I was a kid, my brother, Mitch, and I were subjected to whatever family vacation my mama and daddy thought up. Granted there were some great ones (Hawaii) but there were also some major fails. And though Mitch and I get along great now, there were those teen years when we fought like cats and dogs. Still all those family vacations made for some great memories. How about you? What's your favorite summer vacation memory? Or your worst? Comment below to be entered in today's Cozy Days of Summer giveaway. My favorite vacations as a child were spending the summer in Montana with my grandparents. It was always so much fun! Dawn - That does sounds like fun! We're beach fans, too! Laguna Beach is our favorite, of course. That's a tough question! I really do not like summer, growing up it meant a lot of dirty field work and being hot and sweaty and DIRTY. I loved the days when it was chilly enough that I could wear jeans and long sleeves so I wouldn't get quite so dirty. But now summer is the only time we can get all six of our kids and their families together at one time so those times are good memories. Elaine - That's the best part of it, isn't it? Having family together. We find as our kids get older it gets harder and harder to do. Up until my brother came around (he is13 years younger than me), my family use to take vacations every Summer. We covered over half of the US, visited Mexico and Canada. My favorite was when we took a 3 weeks vacation and visited the West. We went up in the Arch in Missouri, the Grand Canyon, Carlsbad, stayed with family in AZ and CA and came home through the most horrible storms in the Dakotas. That was the last trip we made, but it was awesome. Sounds like a wonderful trip, Kelly. Your family packed a lot into 3 weeks! My favorite summer vacations were always the two weeks we spent in Florida with my aunt, uncle and three cousins. My favorite vacation was a crafting cruise. I was able to take classes with Tim Holtz and others while my husband was entertained with other activities, such as scuba diving, etc. Barbara - We've never heard of a crafting cruise but that sounds like it would be great fun! You get to spend time on something you love and there are other things to entertain the hubby. Good question, made me think. When I look back it's hard to pick one. As a child and teenager my grandparents took us on a small road trip vacation in the Midwest every summer. Many times I resisted or thought we should be staying in a fancy hotel or going some place "fun." But now I realize my grandmother was trying to show us many different thing and just how much fun we really had. We counted states we saw on license plates, sang songs, drank sticky sweet lemonade in the car, stayed in unique motels, cooked breakfast at rest areas, and stopped at every marker for "Place of Historical Interest" on the way. Grandma C- Oh my, that sounds like fun. What a great experience! Makes us want to pack up the grandkids and hit the road! Sounds like a memorable and beautiful experience! Love that palm tree picture! Spending time with my cousins in OK but my vacation would be a trip to California to see my niece and nephew and be able to meet my niece's children. Sounds like a trip to look forward to, Becky! The summer we stayed in a cabin in Maine. Had lobster almost every day. Lobster every day? Now, that's a vacation! Maine is beautiful. My family and I went to Nevada and visited Lake Tahoe, Reno and Virginia City. We had a wonderful time. Lake Tahoe is so beautiful. Your trip sounds like a fun one! I love visiting the Oregon coast. Even on a hot day it's cool and refreshing! That's a great way to describe it, Melanie. It is cool and refreshing! This would be a great book to win...I had two greyhounds who were rescued from the track. Win or lose I will add this book to my list of TBR! Bless you, Ellen, and the others who rescue animals. Our pets are all rescues. We learned so much about greyhound in writing this book. They are such wonderful dogs! I loved our yearly vacations at the shore in Ocean City. New Jersey. Worst vacation: Does having your vacation cancelled about a week before it was to start, count? Last year we were scheduled on a 12 day Alaska land/sea tour. A week before we were supposed to leave, Celebrity Cruises cancelled their cruise due to "mechanical problems". As a result the entire trip was cancelled. We had only booked this tour 11 months before. As a result we didn't get to go anywhere. Definitely not a "good" vacation memory. Not a good vacation memory at all. We'd say that counts as a "worst." Especially when it's a trip you've been planning for months! I can't begin to pick a favorite. Growing up we usually went to the beach, looked for shells and played some mini golf. Since marrying my hubby we usually go on road trips across the states, all of them have beauty in it's each unique way. Every vacation has its own headaches but I try to dwell on the beauty and fun. I do have to say though that Epcot is my rejuvenation area, lol. When I was eleven, my parents bought a tiny island in a lake in New Hampshire. My dad was helping some older boy scouts to build kayaks and he designed and built two little ones for my brother and I. We spent summers paddling all over that lake and having a blast. The kayaks are long gone and the kids are now my grandchildren, but we all, me, my kids and their kids spend a week camping on that island every summer and every summer is a treasure of memories and fun. Oh, Skye, that sounds like so much fun and how great that you and your family are making new memories! 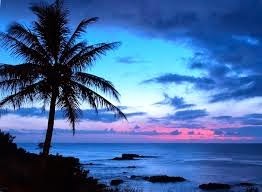 I love the sky in the Hawaii picture -- blue and some pink. I haven't traveled too far. I never go anywhere anymore but one good trip I had was to Williamsburg, Virginia, in 2000. I visited the colonial area and went to Busch Gardens twice. I went to the water park (but wouldn't go to one again because I can't swim so it's not really my thing). There was lots of shopping including an area near the colonial area and there were also about three outlet centers (loved them!). I also went to Toronto twice. That's another good place to visit. There's a big mall downtown. I didn't go up in the C.N. Tower but I visited the gift shop. I took a day tour to Niagara Falls. Michelle - We've not been to Toronto but we hear it's a great place to visit. We love little shopping areas with unique stores and, of course, outlets with great deals! I haven't been to Toronto in years, but I adore that city. It's my favorite big city and I generally don't like big cities. When I was in high school I went all the time. I don't really have a favorite or worst. They were all moderately pleasing. I enjoy my vacations much more now that I'm older and can make my own choices about where I want to go. Cousins coming to our farm for a visit and lots of fishing. I love the Cat in the Stacks mystery series. All the other books I've seen on this site look awesome. I love finding new authors to read. Betsy - We agree the Cat in Stacks series is great! When I was living in Texas I decided to take a real vacation-not just visiting friends and family, I chose Lexington, Kentucky and had an amazing time. I went to Keeneland Racetrack several times, including an insiders breakfast with trainers and jockeys. I took a tour of Calumet farms and other racing stables and I got to meet my hero, the thoroughbred Affirmed, the last Triple Crown winner! Wow, Kat. That sounds like a lot of fun. Getting to meet trainers and jockeys must have been really interesting. We'll have to look up the information on Affirmed - sounds like there must be a story there. And what a joy for you to get to meet him! my most favoritest place to vacation is Orlando.....I love going to the parks!!!! The parks in Orlando truly are an all-about-fun getaway! My best were going from New Jersey to Tennessee with my family. I loved the drives thru the Great Smoky Mountains. So beautiful. And, Reelfoot lake. my favorite vacation memories are always when i am with my entire family. We usually go either to Myrtle Beach or Key Biscayne. Play lots of miniature golf, eat alot, laugh alot. And we always go to a baseball game. Marcy - The beach, food, miniature golf, baseball, and family. What could be better? Favorite vacation moments: road trips with my parents - special anniversary trip with my husband. A special anniversary trip is a great way to make new memories. The worst was all the hawk sized mosquitos in Minnesota, but camping with friends sort of made up for it, even when the tent started to float away. Dogsman - LOL! Hawk-sized mosquitoes? And a tent that floats away? Those are the kind of vacation memories that often, though not fun at the time, make for funny stories afterward. I don't go on vacation but I love animals and greyhounds are beautiful! You're right, Robyn. Greyhounds are awesome! We lived in NE Iowa at the time, so our trip would entail six hours travel time in a 1980 Mercury Marquis with three children in the back, one up front. Unfortunately, someone had gas. Really bad gas. About an hour into the trip, windows were down trying to air out the car and my sister began to cry due to the odor. Really? Cry? The windows rolled down while the vehicle went sixty plus miles an hour down the highway did not help the sound levels or the heat in the car, let alone the smell. The trip ended longer than originally planned due to the many stops made with the hope of easing the gas. I admit it. It was me. Wow, Julesbug, that is a "worst" summer vacation! All my summers as a child were spent on Plum Island, MA. My parents owned a small cottage & I was lucky to be able to spend most of my summer days on the beach. Pure heaven! I so wanted to read this story. Thanks everyone for stopping by and sharing your best and worst vacation stories with us. Now all the names go into the hat and the winner is... Linda Kish! Linda send us your information and we'll get your prizes out to you! I remember one summer, after driving around for hours and spending two weeks at the lake, us kids found out we were only an hour away from home. lol We always went to one of the many lakes in Michigan or Indian River to fish. I am loving the cover for this book. We spent a few weeks in Germany every summer visiting my mother's family. I loved every one of those visits. As an adult working for an airline, I was able to continue those visits for several adult years. Unfortunately I havent been in over 15 years.